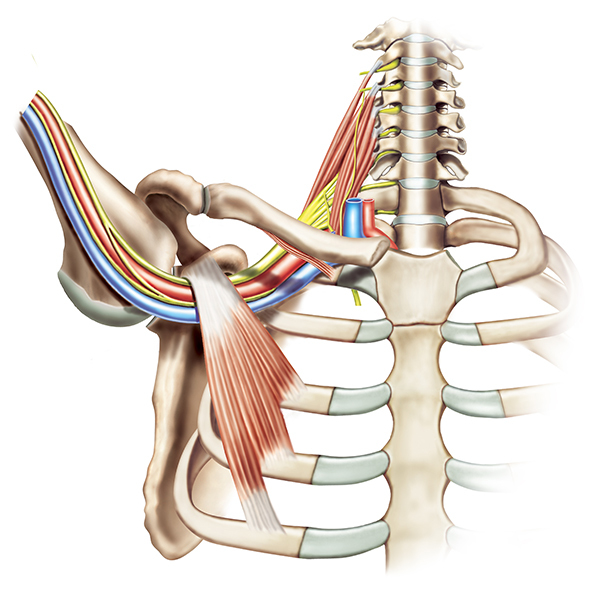 What are the causes of Thoracic Outlet Syndrome? Thoracic outlet syndrome can result due to injury, tumours that press nerves, poor posture that compresses nerves, weight lifting, anatomical defects such as an elongated C7 transverse process and cervical ribs, anomalous tissue overgrowth, upper thoracic neurovascular compression, costocoracoid tendon, subclavian muscle hypertrophy and so on. The symptoms of thoracic outlet syndrome may include numbness and pain in the neck, shoulder and arm, tingling or burning sensation, weakness, limited range of movement of arms, and swelling or redness of your arm, or colour changes to the arm or hand. A proper diagnosis is very essential for the condition of thoracic outlet syndrome. To evaluate your condition, your doctor will perform a physical examination and collect your medical history. You may be advised to have a chest X-ray, MRI or CT scan. Nerve conduction velocity study may be suggested to check the conduction of electrical signals in the nerves. Physical therapy- Exercises can decrease the pressure on the nerves and blood vessels and also strengthen the muscles surrounding the shoulder. Maintaining proper posture can help you stand, sit and walk straight.